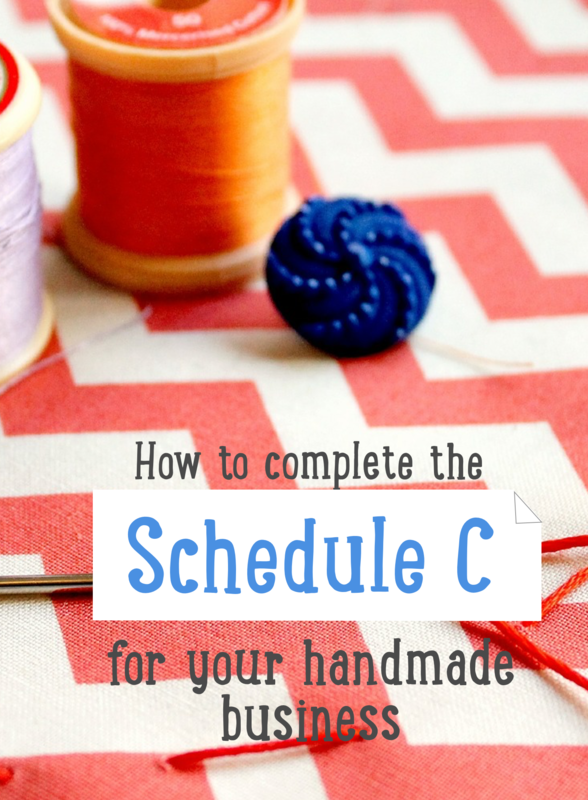 A Schedule C is a form that self-employed, US based handmade sellers need to complete annually in order to report to the IRS the amount of money they made or lost that year. The full name of the form is Form 1040 Schedule C: Profit or Loss From Business (Sole Proprietorship) and should be completed and submitted alongside your income tax return. In most cases, people who fill out Schedule C will also need to complete Schedule SE, "Self-Employment Tax". If you haven't filled out a Schedule C before, it can understandably look quite daunting. The IRS provides 18 pages of accompanying documentation which can be really helpful for the finer details, but to get you started, we've provided a line-by-line summary of what each section means to a handmade crafter. There are a huge number of codes to select from which can be quite daunting, but we've made a summarised list of the most common NAICS codes for handmade sellers. It may be in your best interests to choose a category that implies that you are a manufacturer rather than a general retailer. This generally means that the IRS will compare your return to others in similar situations and will also assume that you will have significant inventory costs. If you have a business name, enter it here. If you don't use a business name then you should just leave this blank. An EIN is a Employer Identification Number (also known as a Federal Tax Identification Number), and is used to uniquely identify your business to the IRS. Important Note: This is not your SSN. If you don't need an EIN, you can leave this line blank. This is the address that your business is officially registered. If this is also your place of residence (i.e. you work from home) then you should leave this blank. This can either be Cash or Accrual depending on how you are accounting for your expenses and revenue. It is recommended that inventory based businesses use the Accrual method, however for small business either is acceptable. G Did you “materially participate” in the operation of this business during (year)? This basically asks if the income you have made in this year was directly from working on your business (i.e. the income wasn't "passive" from activities like investments). There are a couple of different criteria points to meet which can seem confusing, but it essentially boils down to making sure you have worked on your business for a significant period of time in the financial year (they say 500 hours or more which is about 20 days in the year). As a handmade business, you'll have most likely have spent more than 20 days on your business, so you'll most likely be marking this one as a Yes. This one is fairly self-explainatory: if you started the business during the year you are claiming, make sure you check this box. I: Did you make any payments in (year) that would require you to file Form(s) 1099? J: If "Yes," did you or will you file required Forms 1099? This is required if you have paid out at least $20,000 to a single vendor in the course of the year. If you have paid a total $20,000 in expenses but all to different vendors, then this would be No. Also, if you have paid for contract help or paid rent and the total of this service is greater than $600, then you will need to ensure that you (or your contractor) completes 1099MISC. This is your total income from all sales made during the year. This is the total of any refunded orders that you paid back to customers. A refund is any amount you have returned to the customer for defective, damaged and unwanted products. Include both full refunds and partial refunds here. This is really just a working number, used to ensure that you definitely aren't including any of your refunded amounts in your total income. This will be your Cost of Goods Sold total as calculated on the second page of the form. It's best to skip this for now and return to this box once you have the numbers you need. Subtract your Cost of goods sold total (4) from the amount on line 3 to get your Gross Profit total. After adding other income (if any) on line 6 to gross profit on line 5, you'll end up with gross income. You can deduct the expenses of running your vehicles if they are essential to the running of your business. You have two ways of accounting for this expense: actual and standard mileage. If you have less than 5 vehicles, and haven't claimed in a past year using the actual method then you can use standard mileage calculations. If you have been logging your expenses in Craftybase, then you will be able to use the actual method here. This is for any money you paid to other businesses or individuals for services. This can be fees paid for market stalls, commission paid for items you have sent out on consignment and any fees payable for online marketplaces like Etsy. If you hire people to help in the running of your business, you'll need to account for this expense here. Depreciation is required for business assets with a useful life more than a year. There is no minimum guideline on how valuable the asset needs to be before you should try to claim using this method, however a good rule of thumb is that assets below $100 in value are better expensed in supplies rather than depreciated. This can include the costs of your accountants, tax preparers or any legal service. The postage costs you incur in sending out your orders should be included here. Also stationery and supplies for running your office (e.g. printers, ink, tape, stapler, pens). Anything that is likely to be not be completely used up within a year should be included here. Any repairs on equipment you use in the running of your business should be put here (e.g. repairs to your sewing machine). This should include any supplies you have on hand that you a) expect to use up completely within the year and b) are not directly used to produce your finished products. These items will not be included as part of your Cost of Goods Sold as this should only include materials you directly use in your products. Shipping labels, paper, bubble wrap and other packaging materials should be included here. Also, any material that you do use in the production of your products that is difficult to inventory accurately can also be included here. Examples are and glue and thread: measuring exact amounts used of both of these materials is impractical in most cases and thus can be included here. Any sales tax you pay at a state level, along with any licences you need to pay in order to run your business should be included here. Different allowances for travel exist for certain circumstances, so it is best to check with your financial adviser first before logging and claiming these types of expenses. Generally you need to make sure that any travel / meals you are claiming here is wholly for the purpose of running your business. Delivering a cake to a client would be an example of travel for business purposes, as would a trip to purchase supplies. Claiming travel for a family vacation to Florida as you also purchased some supplies while you were there should not be claimed. Internet and telephone bills can be included here, if they are wholly for the running of your business. These can include any expenses not covered in any of the other expense categories above. Software you use to run your business can also be included here: Craftybase is business software and thus can be claimed in this allowance section. If you haven't included any of your online sales channel fees (PayPal / Etsy etc.) in the Commissions and fees category, then you can include them here instead. This will usually be Cost. As a handmade business, you will most likely be a Qualifying small business taxpayer which means that you are able to use the Cash method of accounting. If you are using the Cash method, then you are required to use the Cost method for valuing your closing inventory. The cost method requires using either the FIFO, LIFO or Weighted Average method. If you are using Craftybase to help complete your Schedule C, we use the Weighted Average method to determine your totals. 34: Was there any change in determining quantities, costs, or valuations between opening and closing inventory? This is to see if you have changed the way you account for your inventory as this could have an impact on your opening and closing inventory tallies. If you haven't made any changes to the way you calculate your inventory, you'll be marking this as 'No'. 35: Inventory at beginning of year. If different from last year’s closing inventory, attach explanation. If you have completed a Schedule C last year, take the number from Line 41 and enter it here. If this is your first Schedule C, this will be zero. This is the total of all purchases you made during the year. Ensure you remove any purchases made then removed from your inventory for personal use. If you have employed anyone to assist you with your craft business during the year then you would account for this cost here. Keep in mind that this cost is mainly for official employees (that will have a W2). Contracted and casual workers should be instead factored in at Part II, Line 11. This section is reserved for any materials and supplies not already included in your inventory totals above that are also not being claimed as supplies in Part II. Common usage of this section is for consumable hardware or chemicals used in the production of your finished goods for sale. This section is to provide a way of accounting for any other costs directly related to your products that don't fit into the available categories above. 40: Add Line 35 through Line 39. This a work in progress step. 41: Inventory at end of year. This is the total amount of materials you have on hand at the end of the year, including materials that are already manufactured into finished products that have not been sold yet. Another working step, take the total you have for 41 and subtract it from 40 to get your final Cost of Goods Sold figure. Also enter this amount in Part I, Line 4. You only need to complete this section if you have made a claim on Line 9 (Car and Truck Expenses). This is the date you started using your vehicle for business purposes. Line 44a: enter the number of miles you used your vehicle for business. Line 44b: enter the number of miles you used your vehicle to drive between work and home. If you work from home, then this will be zero. 45: Was your vehicle available for personal use during off-duty hours? If you also use your vehicle outside of business hours for personal use, you should check Yes here. 46: Do you (or your spouse) have another vehicle available for personal use? If you or your spouse also use another vehicle for personal trips, then you can check Yes here. 47: Do you have evidence to support your deduction? This asks if you have any records that show how you have calculated the numbers above. Utilising paper based logbooks and expense tracking applications like Craftybase are good ways of ensuring you have enough proof to support your claim. This is the area where you can account for expenses that cannot be included elsewhere on your Schedule C. Bad debts and business startup costs are some examples of expenses that can be claimed here. It's best to speak to your taxation adviser here to see what you are best to claim in this section as it depends on your circumstances. This is where you could claim any other business expenses. For example, your Craftybase subscription would be included here. Remember to also enter the value in Line 27a (Other expenses) above. Whats the difference between a supply and a material?